I apologize for the lack of updates recently. There have been a few major, negative changes recently, so I'm not in the best mood. I also haven't actually gone to any shows in a bit. There are still plenty of albums and EPs and singles and videos to review for now, though. Today, let's talk about Water Your Waiting For by the Miami Dolphins. The cover art is quite a thing of majesty. I think the band is standing in front of a greenscreen that displays industry overtaking a pleasant valley. The Springsteen-esque text and the umbrella really make this what it is. I also really enjoy the toxic colors. The album starts with a short "Intro" that recalls the false 50s pleasantries of the same kind of intro from The Dead Kennedys' Plastic Surgery Disasters. "Flouride", the next track, warns us of conspiracy paranoia, the truth in the untruth. What can we really trust as true? I'm not worried about fluoride in water, but there is much to worry about that the government does do. Going from a rollicking, jumpy off-ness, the song turns into a more forward rocker with a more deadly message. "Connect the Dots" sounds like Björk fronting the Minutemen, and that might be a good summary of the majority of the album. There are nice melodies here amidst the chaotic musick. I like the staccato guitar attack in the middle and the remainder of the song's breaking down. "Kill Them All and Take Their Money" has a great chord progression. It recalls Bo Diddley with its asking of, "Who do you love?" This song makes me worried about my own future. The vocalist does a great job though. "Map Off" really sounds like the Minutemen, especially "Political Song for Michael Jackson to Sing". I like the goofy doo-wop backing vocals, but the song is pretty dark, ricocheting back and forth. "Protect the Children and Drain Your Boat" starts so deathly - "Nobody wants to go to war! Doesn't mean we shouldn't do it." As I mentioned in my review of the show Miami Dolphins played at Roboto, this song heavily reminds me of the ancient Pittsburgh band The Cardboards. Eventually the band shifts to a collage of voices complaining about the dryness of a hamburger. This is a dense song with a lot to hear; you'll need to do some extra listens or fail the class. "It Goes On" comes in much different than the earlier songs. It's like a straightforward punk song. "Let the roads crumble and rivers dry". "Kill our parents, take their money, more, more and more". These are true words for the world we live in, espoused as the song descends into wild guitar and fading feedback. "Speak Up" also comes in strong with heavy drums and rocking guitars. The vocals harmonies are strong and impressive here, self-conversing to where I feel like I gobbled a popsicle and am a little froze up. "Bootstraps" sounds like a cleaner Sonic Youth before it goes off dreamily into despair. "Great Deals" comes in like a wild boar, crunching, beating heaviness. Then it breaks off, seperating like a sea hewn in two by a legendary mystic talking about consumerism. The song ends back in the noise heavies. "Miami Oh Yeah" is a little piece of the repeated title phrase through a vocoder and maybe accompanied by a jaw harp. "Interlude" has a bunch of people talking, mostly a somewhat naive male speaker who seems like he only started looking into different types of economic systems. The title track, "Water Your Waiting For", ends the album. It recalls the initial paranoia with talk of chemtrails. It's a dramatic piece, maybe with some kind of lap steel guitar or horns or something in the background. It makes a fitting end to a difficult album. "Too many dollars and not enough sense". Yep. Water Your Waiting For is deep, deep water. An orange man would say something like "the deepest! we have the deepest depths! our depths are the best!" That is one of the few times that I agree with that orange man, even though it's just a thing I wrote. Really I'm just agreeing with myself, and that might be a very orange man thing to do. 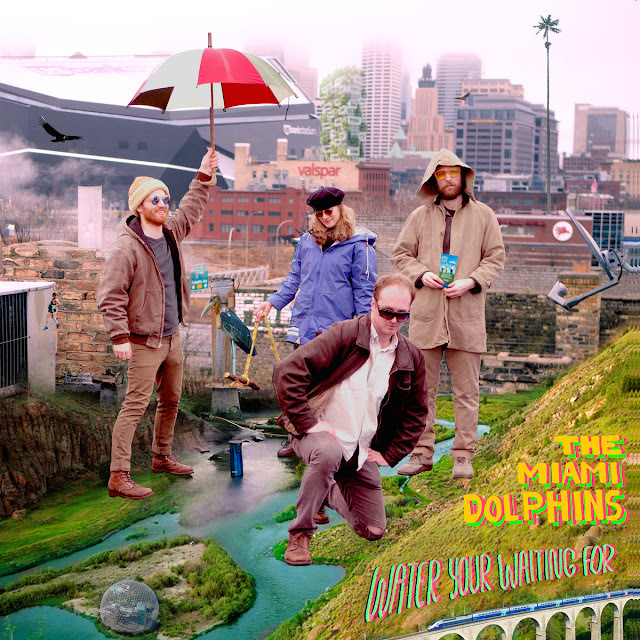 Miami Dolphins make some wild musick on this album that really makes you think hard, and yr brain might sink like a stone into those deep depths. These songs challenge what we know to be true and what we wonder about being true to come to a real conclusion. The production is good, the songs are excellent, and Water Your Waiting For gets a Good. It's one of my favorite albums of the year.